Time was the model kit manufacturers used colorful and exciting artwork to entice us to buy kits. 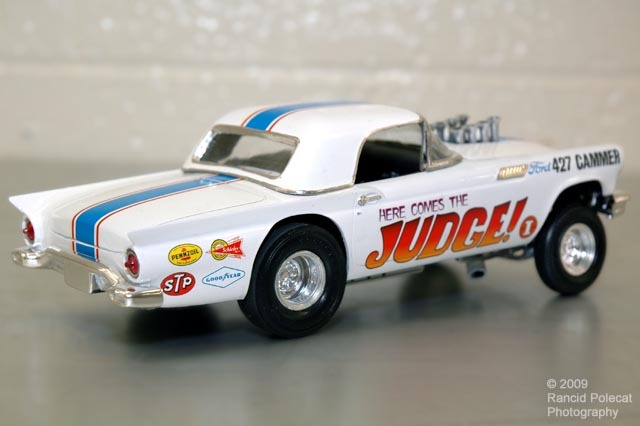 Here Jerry Frazier has recreated the fast-moving car pictured on the box top of AMT's 1969 issue (kit #T235) of the venerable 1957 Ford Thunderbird. The box art car is shown smoking the slicks as it thunders down the track, belching fire from its massive exhaust headers. Jerry's model is a bit more static, but no less exciting to behold.